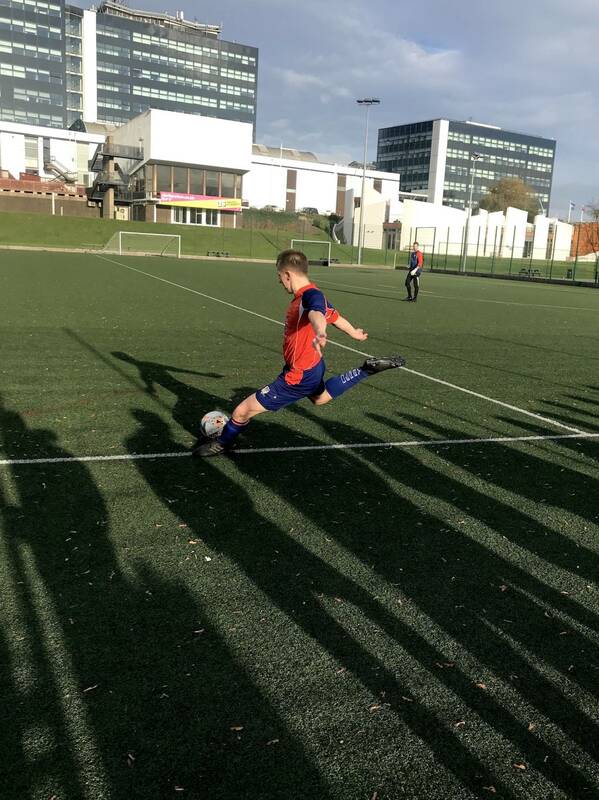 Derby’s Men’s 3rd XI suffered an early exit from the Midlands’ Conference Cup as they lost 3-1 at home to the University of Bedfordshire 2nd XI. A goal either side of half-time for the visitors, through no.12 Nath and no.11 Steph, propelled Bedfordshire into an unassailable lead before a penalty from home striker Isaiah Taylor gave hope of a comeback which never materialised. Both sides went into today’s game looking for their first wins of the season, with Derby having lost both of their opening matches, against Leicester and Oxford Brookes, while Bedfordshire were looking to bounce back from a 2-1 loss to De Montfort 2nds. It was the visitors who got an early break when a corner from the left caused havoc in the Derby six-yard box and was eventually smashed home by Steph. Derby attempted to respond with their first real opportunity of the match when winger Tommy Daws was played in behind the defence. However, Taylor failed to beat the visiting goalkeeper from close range after being picked out. Aaron Hayer then dragged a 25-yard shot wide for the hosts before they were given a let off. Bedfordshire centre-back Cam headed home from a free-kick, only for the linesman to halt the celebrations by raising his flag. The lead was doubled just before the break when Bedfordshire no.10 Cal charged into the 18-yard box before teeing up Nathan who slotted home from the edge of the area. It was that goal scorer who effectively put the game to bed after 52 minutes when he raced onto a backheel from Steph and rounded Derby ‘keeper Dan Lawlor-Potton to complet his brace. A lifeline was handed to the home side just after the hour when Bedfordshire captain Adam was penalised for blocking Kallum Kirk’s shot with his arm. Taylor stepped up and slotted the ball into the bottom corner. The hosts felt aggrieved after another strong penalty appeal for handball was turned down by the referee with six minutes remaining, but they ultimately paid the price for a disjointed midfield performance. After the match, manager Earl Taylor spoke on his side’s poor start, branding it “disappointing” but emphasising that they are “trying to play the right way”. 1st year Football Journalism student.